The eye catching red Christmas bow is just the right touch to make your friends and family feel welcome this Christmas. 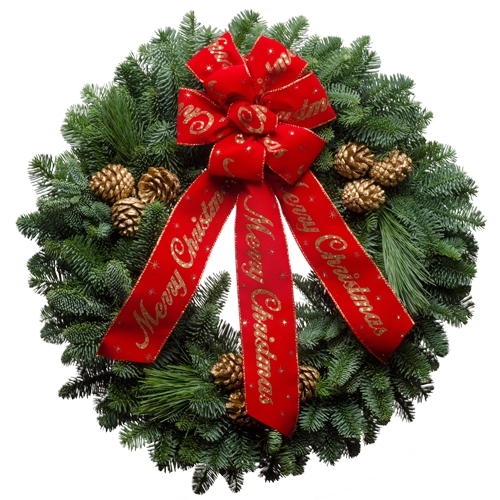 It�s a great Christmas wreath to match your good wishes for a Merriest Christmas ever. The red velvet bow has gold lettering that says Merry Christmas and it isn�t captured fully in this image. It is a great bow on a beautiful wreath. "The Christmas Forest wreath we sent to our friends last year held up and looked very nice for WEEKS. I'll be back to order every year."